Am I imagining it or is WUWT getting more dismal by the day, without the light relief of articles like "OMG it's insects" and "Russian steampipes caused global warming"? Seems to me that Anthony is really dumbing down his blog. He hasn't been able to attract many "guest essayists" and is having to write more himself. He has little imagination though so WUWT is becoming really dull. 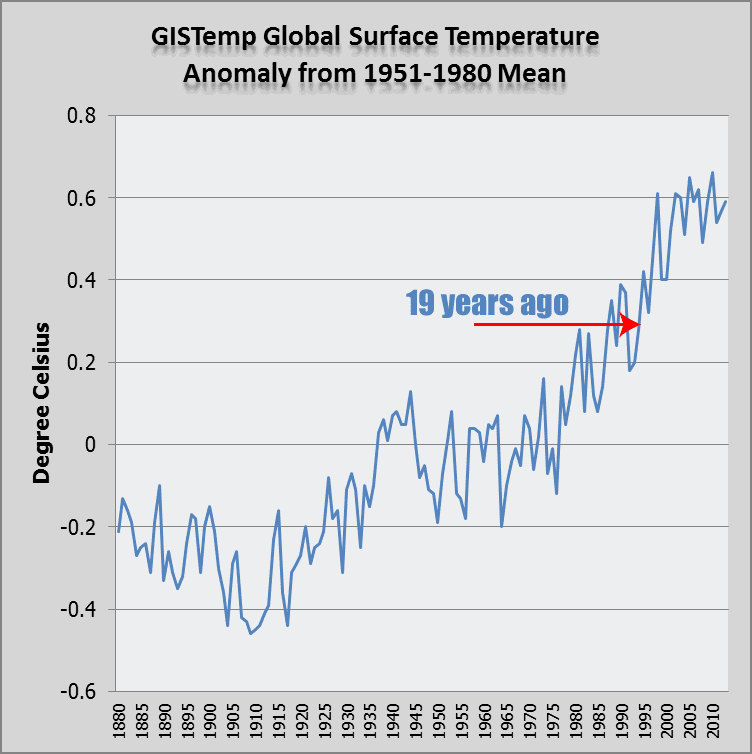 Anthony reckons there's been no warming since 1995 but that's because he doesn't know how to read a temperature chart. Have a look again at the above chart. It's monthly, so there's a lot of noise. Still it's not hard to see that at the left of the chart many more months have much lower temperatures than to the right of the chart. And if you're still having trouble, look at the bottom axis. The left hand of the chart where the temperatures are lower is the mid 1990s. The right hand side is closer to today. That means that the surface temperature is rising still. What else? Well Anthony is leaving out the oceans, which absorb 90% of the extra heat. Here's a chart that shows this. It's from a previous article from when deniers decided that it hadn't warmed since 1996. Now if you want even dumber denialisms look no further than the WUWT comments. You're wondering if it's possible to cap Anthony's chart. Well, yes, it is. It looks as if a lot of WUWT-ers have only just discovered CO2 and don't know what to make of it. And what do you know, the link to the source for the update has been broken. Earlier this year it was reported that the CO2 level had crossed the 400 ppmv. roof set to be castrastious. That was also reported in a article with the headline; “The sky is falling!” Now, however, the link is gone, the level is sinking, but reportedly is increasing – are we witnessing more data tampering? I agree, it was a long time ago that the 400ppm was forecast as being a danger level that was ‘imminent’. With all the data tampering by so called climate scientists in the past, it surely must be a distinct possibility that these data have also been made to suit the warmist cause. ‘. Is there any possibility that an independent check on the atmospheric pollution can be made to either agree or disprove these figures? Good post. The “acidification” scare is having a hard time getting traction, for the reasons you cite. The only reason it is mentioned is because the label sounds scary to ignorant people who know nothing about the oceans’ immense buffering capacity. When CO2 rises from 3 parts in 10,000 to 4 parts in 10,000, over a century and a half, that is hardly going to change the oceans’ pH. CO2 is only a tiny trace gas. The ocean doesn’t even know it’s there. Pamela Gray wonders about medieval CO2. She seems to think that CO2 molecules all wait in line in the ocean and "come out" one by one in the order they were absorbed. Does the ocean punish CO2 molecules that jump the queue? What about the carbon that turns into shellfish? I wonder if there is a way to determine whether or not any of this CO2 is from the Medieval Warming Period? The oceanic CO2 cycle is anywhere from 500 to 1000 years between sink from to release back to the atmosphere. Just about now we should be experiencing lots of released CO2 that is anything but of recent origin. Right on!! For decades we have been told of abyssal currents which take a thousand years or so to transport cold water from carbon sink areas (near the poles) – carbon solution being more effective in cold water during ice ages, such as the LIA – to upwell and release their ancestral CO2. The timing is aboutt right for this LIA ancestral CO2 to re-emerge. A more significant source for increasing atmospheric CO2 than anthropogenic “carbon” emissions????? Peter Yates is convinced that burning vast quantities (or any quantity) of hydrocarbon doesn't result in CO2. (Not very bright is Peter.) He reckons that CO2 will start decreasing soon because ...the medieval warming period finished 800 years ago! I don’t know if there is a way to determine which period the CO2 comes from, but …. There appears to be a correlation between the increasing temperatures in about AD 950, and the increasing CO2 levels that started about the year 1750.. (950 plus 800 years), .. at least in the Arctic areas. If there is any truth in this correlation, CO2 levels should begin to *decrease in the next decades – until about the year 2050 .. (1250 plus 800 years). Yes, I know, this all seems to be too neat and tidy. .. Maybe it could be an example of Ockham’s razor! Chris Wright wonders about the supposed 800 year lag in CO2 and the Roman period. These guys do love their warm periods don't they. It would be fantastic if this were true, but there may be a serious problem. The previous warm period was about a thousand years before the MWP, during the Roman period. If there were no corresponding CO2 increase around 1000 AD, then the theory is probably wrong. Is there any evidence of a CO2 increase roughly 800 years after the Roman period – and, for that matter, roughly 800 years after the Minoan Warm Period? latecommer2014 doesn't believe that burning hydrocarbon releases CO2 either, and thinks that because in the past something else caused global warming and cooling (eg insolation changes) then CO2 must always be a follower not a leader of temperature change. That has been my POV for a decade. Since CO2 follows temperature in all studies at all time scales. If this is true, and I haven’t seen data that it’s not, what else could we expect but the release of this gas from past warming or cooling. This is one of the IPCC’s forbidden territories. latecomer2014 is wrong about CO2 following temperature in all studies at all time scales. There've been times in the past when CO2 change precipitated a change in global temperature. And why do deniers think some science is okay (even though they are wrong about it) and yet don't accept other aspects of climate science? 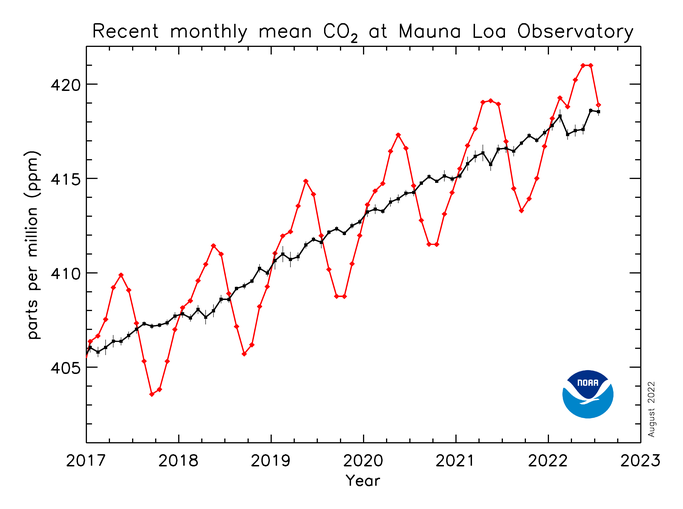 According to Mauna Loa (NOAA) August 2014 CO2 397.01 ppm August 2013 CO2 395.15 ppm. That’s an annual rate of increase of 1.86 ppm. Why did the rate of increase DECREASE so much last month? Thanks Jane, I thought so as well. Indeed, I thought months ago they were already claiming 400 ppm. 1/2 year later and I find out we are about 18 months away from the wholly beneficial 400 ppm CO2 we need. Deniers just stumbled over the seasonality of CO2? Only see a conspiracy? It is beyond embarrassing. So the oceans are acidifying and releasing CO2 at the same time, due to climatic changes 800-1600 years ago that they were just waiting on. That's quite a trick! One could make a good case for the uptrend line drawn by HotWhopper, starting with the low point on the chart in 1996 being valid thru 2007. This uptrend line was tested successfully by touching lows in 2001, 2004 and 2006 and as late as 2007, temperatures remained above that strong uptrendline. However, in 2008, the uptrend was severely violated and since that time, temperatures have been below the trendline much more often than not. Remember, since this trendline is defined by lows for the first 11 years, in order to remain valid after 2007, temperatures at their low points must continue to stay above the trend line, which by virtue of the first 11 years, is defined by the lows. In other words, you can't have a trendline for 11 years at the lows, then continue with it, even as it morphs into a line that defines highs. It's ok to draw a trend line that is assessed using the mid range for a period but it has to start at mid range and end at mid range.....not start at the lows and end at the highs. Just to make it very clear. The line I drew in the top chart was tongue in cheek. It was to illustrate the idiocy of drawing random lines from one point to another and making a declaration on the basis of it. When it comes to short periods like six years (since 2008), it makes no sense to try to determine a *climate* trend looking at monthly data (or annual data). Not only is the time period too short for climate, but there is way too much natural variation and seasonal variation (in the monthly), which swamps any signal. Perhaps if one is a statistician one might attempt it with lots of careful analysis - but certainly not on the strength of eyeballing any chart. Meteormike, if you are referring to the line I drew in the top chart, it's meaningless to talk about temperatures being mostly below the "trendline" since 2008, because the trendline I drew isn't a trendline at all. It's a random line drawn between two monthly data points years apart. The months are probably different months. They could well be different seasons. I didn't check and didn't care - any more than Anthony Watts cared when he drew his dumb line. I was making a point about random lines and cherry picked end points. "Just to make it very clear. The line I drew in the top chart was tongue in cheek. It was to illustrate the idiocy of drawing random lines from one point to another and making a declaration on the basis of it. I think you know this animation from NOAA, but I cannot recommend it highly enough. It shows the sawtooth yearly changes, the latitude-based breathing pattern, and then the deep history. Wonderful visualization in ~3 minutes. I don't think the ocean heat sequestration question has been settled. The scientists are still looking at the question. Carl Wunsch and Patrick Heimbach report a significantly smaller amount in their recent paper than others such as Hansen, Lyman and von Schuckmann in the three separate past papers did. The range of results from these esteemed scientists might cause one to wonder what the answer is? There differences are material. To compare them on the low end we had a relative value of 2 heat going into the oceans. On the high ended we had a relative value 8 heat going into the oceans. When the answers range from 2 to 8 in peer reviewed papers, I feel it is not justified to claim that all or most of excess heat has gone into the oceans. Lyman, J. M., S. A. Good, V. V. Gouretski, M. Ishii, G. C. Johnson, M. D. Palmer, D. M. Smith, and J. K. Willis, 2010: Robust warming of the global upper ocean. Nature, 465, 334–337, doi:10.1038/nature09043. von Schuckmann, K., and P.-Y. Le Traon, 2011: How well can we derive global ocean indicators from Argo data? Ocean Sci., 7, 783–791, doi:10.5194/os-7-783-2011. 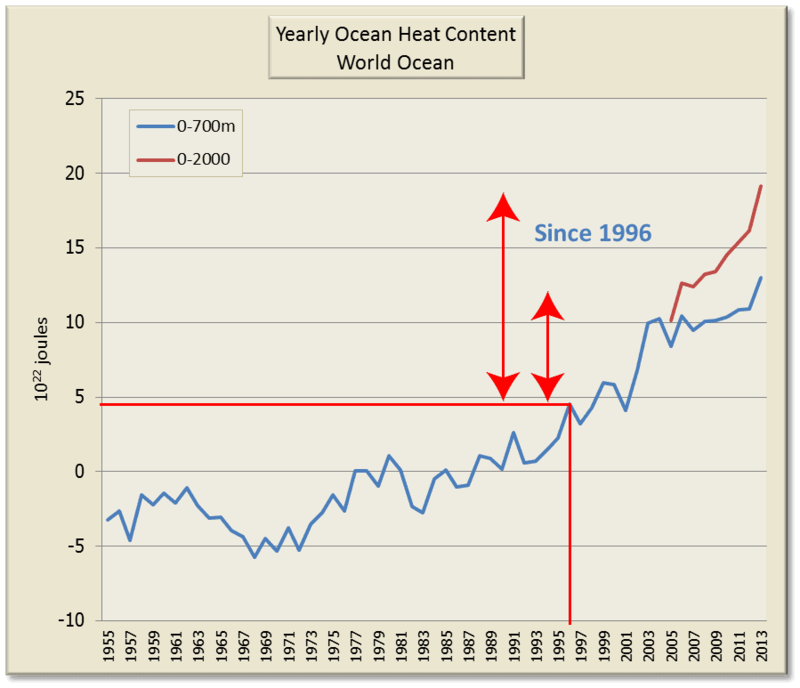 You would be correct if you are thinking that estimating changes in ocean heat content going back decades is not an exact science. For one thing, the Argo floats have only been deployed in recent years. For another thing they don't sink below two kilometres. THE article by Graham Lloyd will likely leave a mis-impression with many of your readers concerning the substance of our paper that will appear in the Journal of Physical Oceanography (“Puzzle of deep ocean cooling”, 25/7). We never assert that global warming and warming of the oceans are not occurring — we do find an ocean warming, particularly in the upper regions. Contrary to the implications of Lloyd’s article, parts of the deep ocean are warming, parts are cooling, and although the global abyssal average is negative, the value is tiny in a global warming context. Those parts of the abyss that are warming are most directly linked to the surface (as pointed out by Andy Hogg from the ANU). Scientifically, we need to better understand what is going on everywhere, and that is an issue oceanographers must address over the next few years — a challenging observational problem that our paper is intended to raise. On the other hand, if you are trying to say that the extra energy on earth is not going into the ocean, then where do you think it is going? Somewhere on land? Or maybe you think the satellites are incorrectly recording the amount of outgoing radiation. Whichever it is, the next step for your research will be to see if you can figure out which land surfaces are absorbing all this extra heat. Why they would absorb more than the ocean (which has vastly more heat capacity than the air or the surface), or what is wrong with the satellites recording outgoing radiation. For example, CERES, which monitors the flux at the top of atmosphere. Is it exact all over everywhere? Probably not. Is it the best information we have? Probably so. Jim Steele has not come out of that consideration with anything approaching flying colours. He even came here to HotWhopper and doubled down on his fibs - for example: here and here. He's also featured in the HotWhoppery. BTW I've now published Ragnaar's two other comments that he made on the Comment Policy page, together with my responses. I hope that clears up a few misconceptions.